If you have a young baby around the ages of 6 to 12 months, the topic of crawling will be one of the hottest topics discussed among your parent circles. Why? First, we all have to admit that crawling is a significant milestone in a baby’s life. It’s a big jump to see baby graduate from being ‘marooned and helpless’ in one location to constant exploration everywhere! Crawling is also sometimes used as an indicator to check whether your baby is developing normally physically. It is often hard to analyze the development of a baby’s sense of smell, touch, sight, hearing and taste. But crawling is easy to see. Your baby is either crawling or not. When your baby starts crawling, this may be your proudest moment or worst nightmare. In our case, we were ecstatic when our little one could crawl. Crawling gave our baby a newfound freedom of mobility that she had never had before. Crawling allowed our baby to become more independent and free. She no longer needed mommy or daddy to carry her everywhere that she wanted to go. She could now travel around the house wherever and whenever she wanted. She could barrel towards toys that she found a sudden interest in or crawl towards mummy when she wanted comfort. This is not to say that there is anything wrong with your baby if he or she is still not crawling yet or will not be crawling at all! Babies are smart. They will find a way to get to something (or someone) that they really want, whether by crawling or not. You may have seen some babies scooting across the floor to get to their destination. Commando-style of dragging body across floor. Giraffe-style crawl on all fours but with legs and arms extended completely straight. Crying for you to pick them up as their personal user transportation. Although all these movements are valuable parts in your baby’s development (and very cute! ), many experts say that they shouldn’t take the place of crawling. We never believe in making parents feel bad, stressed or judged (gosh, we all feel this too much on our own!) so please understand, that this is not our intention. We merely want to provide information and you can make your own decision of what’s best for your baby. Our baby didn’t seem to want to crawl. Instead, she seemed impatient and almost looked like she was going to skip crawling altogether and move on straight to walking. We noticed that she enjoyed pulling herself up onto her feet. She was even able to move from furniture to furniture by hanging onto them and moving a few steps sideways. However, we had been told that skipping crawling may result in our baby missing out on some valuable skills. So we persevered in trying to help her crawl. Learning to crawl develops different parts of the brain including combining the left and right sides of the brain. Crawling helps promote sensory integration, strengthen hands and wrists, and separate fingers which are useful for other skills later on including learning how to write. It works the areas of the shoulders, elbows and arms which your baby will count on to do other things such as climbing jungle gyms, pulling themselves up and for other kinds of movement-based activities. Crawling involves your baby’s whole body, strengthens muscles, aligns their spine and also helps develop their balance and co-ordination. Crawling assists with visual-spatial development (judging how close or far things are from an object to your baby’s hands). Crawling teaches your baby to shift his or her weight between the upper and lower body and bear more weight on joints. So if those are not reasons enough, here are more from an occupational therapist’s view. All babies need time to work out their crawling prowess. But many babies also need motivation and encouragement to do so. After all, crawling is not particularly pleasant as it does exert pressure on different parts of the body including palms and knees. Although we firmly believe that you should never pressure baby in a negative manner (for example, threatening or using fear to motivate a baby), there are things that you can do to help your baby work on his or her crawling skills. Encourage your baby to move around by being both mentally and physically prepared for him or her to do so. You can do this by babyproofing your house so you don’t have to worry about your little one crawling to something that is dangerous for him or her. I cannot mention to you the number of times that I have met moms who don’t want their babies to crawl yet because they are worried about their homes not being safe. This presents itself as an inner conflict if part of us want our baby to meet their milestones and yet another part of us are worried that they will! Make it easy for yourself- start babyproofing your home early! You have to do it eventually anyway so why not start now? Especially when you are in the middle of winter, it is tempting to keep your precious little one completely bundled up. But try to make an effort when you are in a relatively warm room to take socks and mittens off so that your baby can get used to feeling and touching the ground. It is also near impossible for babies to crawl with too much extra clothes on because it’s too confining and slippery. So when it comes to crawling, less is more. When your baby can sit up unassisted, it is tempting to leave your baby sitting up instead of lying on her stomach for tummy time. After all, your baby can reach more things in a sitting up position and is generally happier (which of course means less crying). We made this same mistake thinking this too. Unfortunately, when baby is not on tummy time, she is less likely going to crawl. After all, why would she get down into that position if she can be sitting or standing up? So it’s important to continue to encourage your baby to spend more time on tummy time. Have you ever seen your baby kicking wildly while lying on his or her stomach? It could be that your little one is wanting to crawl but hasn’t yet worked out how to his or her legs to create friction against the floor to move. Help your baby by using your palms or arms to press against baby’s feet to create some pressure so that he or she can feel what it’s like to push off. Some parents believe that their baby hasn’t yet crawled because they are too heavy or big or their muscles are still not strong enough to lift their body up. We thought this was the case for our baby too (although she wasn’t that big). So we occasionally would help her out by using our hands to lift her stomach up a little so that she was in the crawling position and on her palms and knees. We think this helped her to get used to the idea of being in the crawling position. Sometimes you just need to role model to your baby how to crawl. After all, your baby watches your every other move and copies it, right? We believe that our baby found it too ‘degrading’ for her to crawl…after all, mummy and daddy didn’t crawl, so why should she? So we had to get down on our own painful knees and demonstrate to her how to crawl. She didn’t do it immediately but she did start to crawl not long after! It’s one thing to demonstrate to your little one how to crawl, but it’s important to also show your little one that you are going to do it together with him or her. We were so happy when our baby crawled her first few steps but then she stopped doing it. So we had to encourage her to start crawling again by crawling in front of and alongside her. She seemed to find this amusing but she would also crawl quicker to catch up. Older siblings can help out with this too. Peer pressure is normally seen as a negative thing but this is where it can be helpful. If your baby is an only child, bring your baby to meet some other baby crawlers close to his or her age and this may inspire him or her to start crawling too in order to join in the fun! If you have hardwood or tiled floors, crawling can actually be quite uncomfortable. Don’t think so? Try crawling on the surface yourself! If you don’t have any carpeted areas in your home, try placing your baby on a foam mat, thin blanket or floor mat on the ground. Beds tend to be too soft for babies to get a good balance to start crawling on. Use it to provide more padding and comfort for your little one on hardwood floors, tiles and concrete. The vibrant multi-colors will add immediate decor value to your baby’s room. It is a teaching tool when your baby is ready to learn alphabets and numbers. It is a multi-sensory toy as the alphabet and number pop outs will create a different surface and texture for your baby to touch. We have played countless games with the mat including peekaboo games. Because the alphabet and number tiles use an interlocking system, you can use it to create shapes including cubes, triangles, tunnels and even a house! We did all the things above and at the end of the day, our baby crawled because she wanted a new toy. Babies are naturally curious and toys are one of the best motivations to encourage a baby to crawl. Whether it’s a toy with flashing lights, an interesting sound or simply something that your little one has not seen before, toys are extremely effective in encouraging a baby to crawl towards it. This was the case with our baby. She simply refused to crawl (not even to mummy who she otherwise, would normally be glued to). However, awesome daddy was able to convince her to make the arduous crawl of 2 feet by placing new toys that she had not seen before in front of her. As she reached close to the toy, daddy would move the toy back again to make her go further. It worked! There are some toys that are better than others when it comes to crawling. Normally these toys are things that either are at crawl level, are designed to encourage exploration while in a crawl position or move so that baby is encouraged to follow it. This snail looks pretty simple but it’s well thought out for young babies. It has a mirror so that baby gets to look at his or her own face. Babies love to look at other babies and it can be used during tummy time too. This snail moves forward to encourage your baby to go after it! However, the wheels on this snail can also be locked so that it remains motionless. This is useful when baby is still learning to sit up or practicing tummy time. This Little Tikes Activity Garden is extremely popular among parents and you can see why. It has so many different parts to it at crawl level to keep your little one amused. This includes a mirror, telescope, moving parts such as window shutters, telephone, mailbox for shapes, balls and a piano! Baby will love crawling around this structure to explore. What we especially love about it is that it can be opened up to become an obstacle course for your baby to crawl through too! 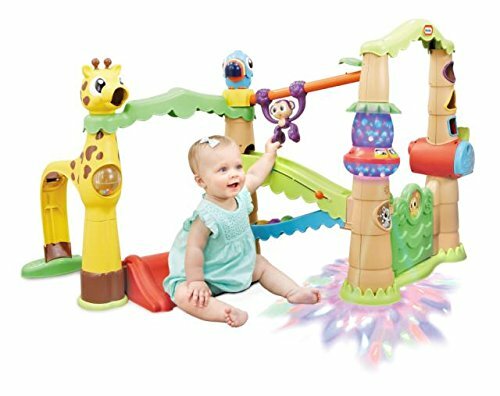 The Little Tikes Activity Garden is great for the development of little fingers, hand-eye coordination and sitting up too. You can also use it to play endless games of peekaboo! On top of this, use it to start introducing your baby to different languages- the telephone plays in English, Spanish and French. Awesome! This is another Little Tikes Activity Garden but it is the Treehouse version. If your baby is one that loves lights, this will be the one that you should pick as it uses multicolored, dancing lights (disco-style) and music to entice your baby to move. The idea is for your baby to “catch” as many “fireflies” as possible by crawling to the dancing lights and depositing these “fireflies” in the “magic lantern”. 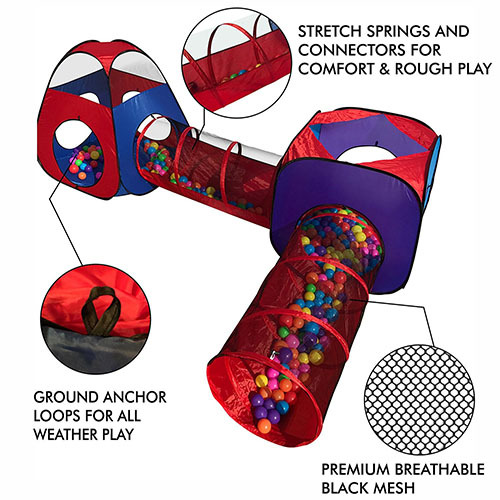 It also has many different activities including a slide, crawl-through-arch, giraffe ball feeders, rolling balls, swinging doors, doorbell and clock. Switch off the lights and have a disco party with your crawling baby! We don’t know why snails feature in so many great crawling toys. Perhaps, some people think that babies move as slow as snails? We don’t know, have to ask the toy manufacturers! 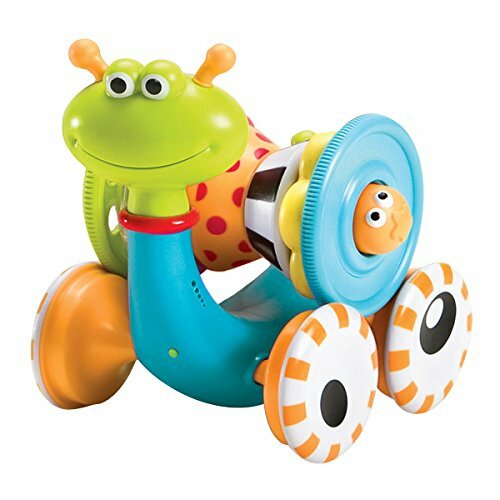 This is another great snail toy for a baby who is learning to crawl. We like that it travels relatively slow (compared to some other moving toys) and so may be a better encouragement for babies to follow along. The snail’s shell spins as it moves and is visually inviting for a baby to come and play. But what we love is that the shell can also be disconnected as a stacking toy. Very cleverly designed! If you have ever hungered for a secret hideout or man/woman cave of your own, you can imagine why this toy will be a hit for your little one. It contains not one, but TWO tents that can be connected to, not one, but TWO tunnels! When you are still trying to get your baby to crawl, you can use the tent to encourage your baby to crawl from one entrance to the other. As he or she gets better at crawling, then use the tunnels. Once your baby has mastered the art of crawling, this toy also doubles as a mega playhouse or keep them disconnected as separate play structures. Garden camping, anyone? Last but not least, make crawling a fun game! The main job for a young baby is to play. 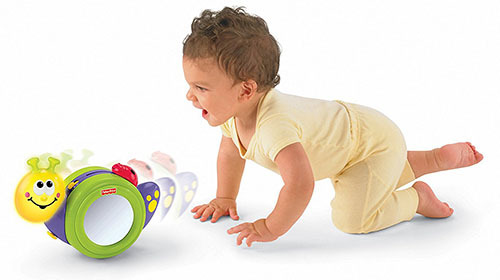 If crawling becomes fun, your baby is more likely to want to do it. Here are some fantastic ideas. Remember that every baby is different. One baby may be a star crawler at 6 months and another, have no interest in doing so until 13 months (we know a baby like that!) Also, what may work for one baby may be a bad idea for another. So just try different things until you find one that clicks with your infant. Most importantly, don’t give up! It may seem like your baby is never going to crawl but persevere. One day, your baby may just unexpectedly plop down on all fours and start crawling to you! © - TheToyTime.com. All Right Reserved.